A call to Marco Vandoni at Ocean Independence brings news that he's signed yet another large motor yacht for sale, this time the 59.4m Vicky. 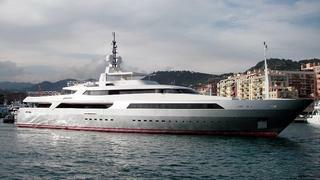 The largest yacht delivered by Baglietto, she was built in aluminium in 2009 to Lloyds class. MCA compliant, Vicky sleeps 10 guests in five staterooms and boasts a host of special features, including a sauna, aquarium, huge Jacuzzi and a heli-pad. Twin 3700hp MTU engines give Vicky a cruising speed of 17.5 knots and a maximum speed of 24 knots. Lying in Genoa, Vicky is asking €35 million.